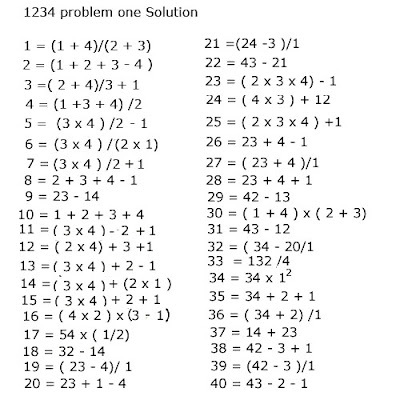 Before we tackle the FOUR FOURS Problem which we carry out in my next session it is easier to start with the 1234 problem which has the same rules. Here we have to express all the numbers from 1 to 100 using the digits only once in each expression. Remember all the 4 digits must be used only once to form the number. The notations allowable are Multiplication (x), division (/), addition (+) and subtraction (-). We also define that the only other symbols to attach to a digit are the decimal (. ), factorial (! - For example 4! 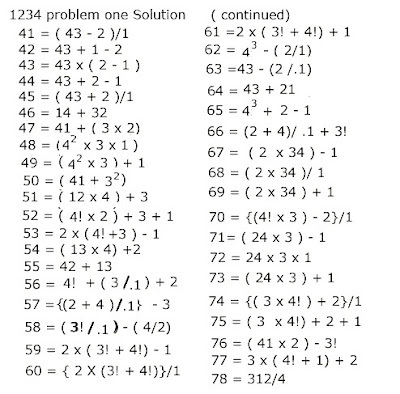 = 4 x 3 x 2 x 1 =24), and (exponential - a digit raised to the power of another digit). 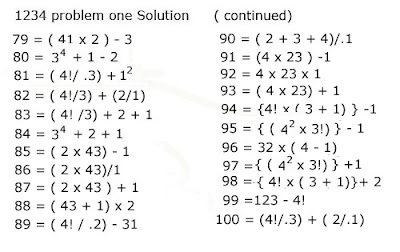 There are several solutions and to make it a little different I am excluding the square root function in my solution.